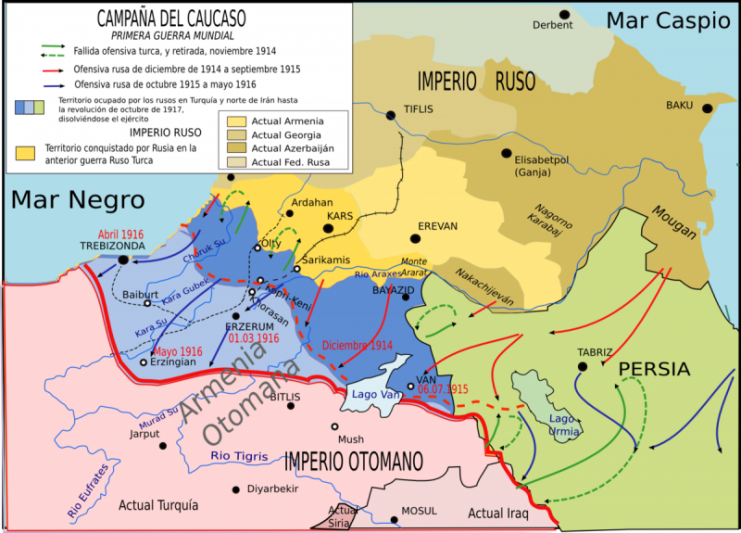 Following the calamitous defeat of the Turkish army at Sarıkamış in late 1914 and early 1915, on the Caucasus Front at the outset of World War I, Russian forces pursued their Turkish counterparts ever-deeper into Anatolian Turkey. 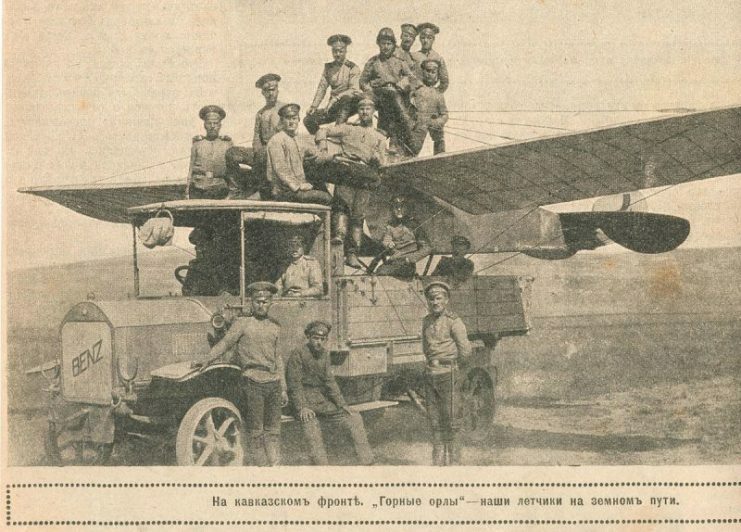 From April to July 1916, the Russian army besieged and then took Bayburt as part of this push into the Ottoman heartland. 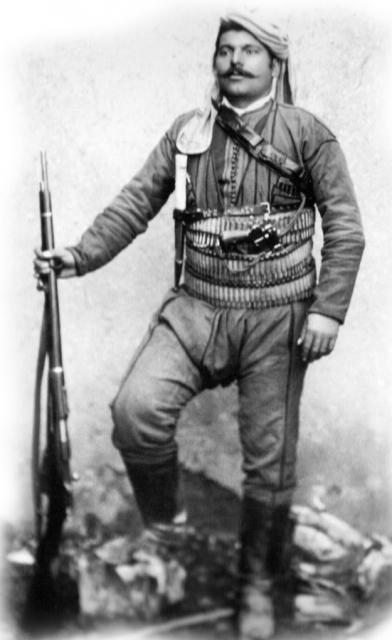 First Lieutenant Ahmed Ekrem was a member of the Ottoman Army’s 52nd Regiment and commanded a machine gun team. 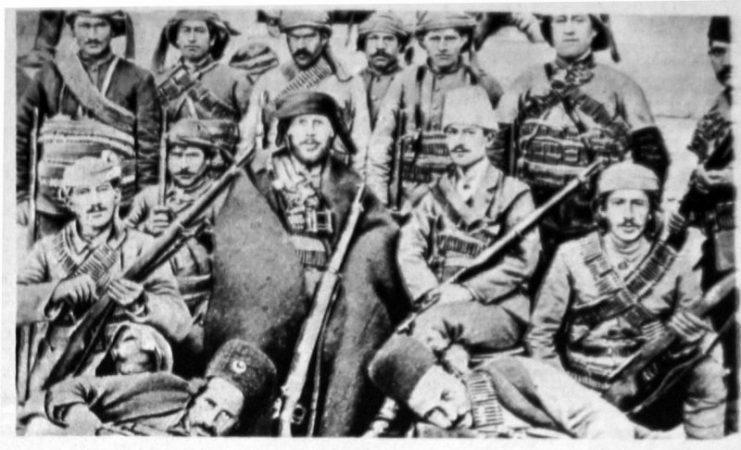 Lt. Ekrem was among the Ottoman forces that had been pushed west after the Russians took Bayburt, and he was taken prisoner after a fierce battle with Cossacks north of Şiran in the southwest of today’s Gümüşhane province. 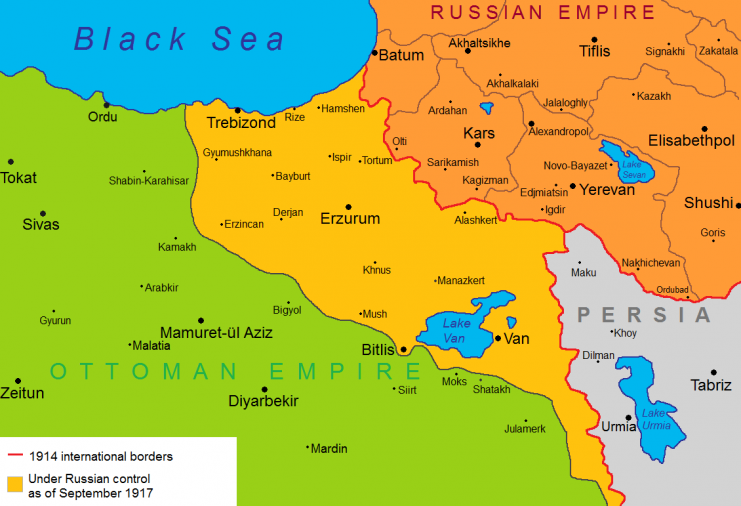 A month after the battle, Lt. Ekrem wrote an account of the event while in a Russian prison camp at Satılmış Gedik, near Kars. He described the posturing of forces and the fighting itself in vivid detail. 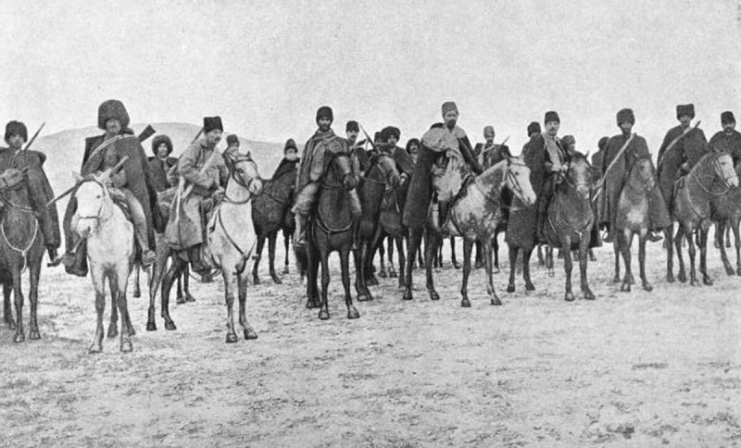 But he also did not spare any sympathy for the Turkish units on the front line, whom he accused of cowardice and treachery for abandoning their positions in the face of the Cossack onslaught, and he cited those units as bearing responsibility for the Turkish defeat and his own capture. 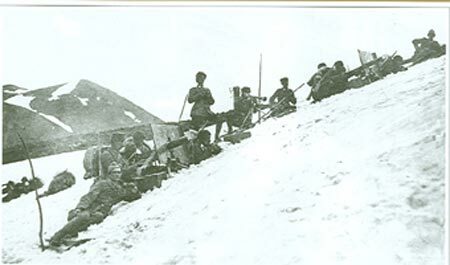 After our Army’s defeat at Bayburt, our Division gradually retreated to the Pulur-Maduma (Gelinpertek) line and occupied a site north of Şiran and east of the village of Mataracı. A position was chosen north and east of Taşlıca Tepe (Taşlıca Hill) as the main line where the forward outpost was situated. Our regiment was assigned to the forward position on the east front (shown as the forward outpost on the map). My company was at the regimental headquarters at Çukuralma, together with a reserve battalion. Trenches were dug at places for machine guns at the forward position. 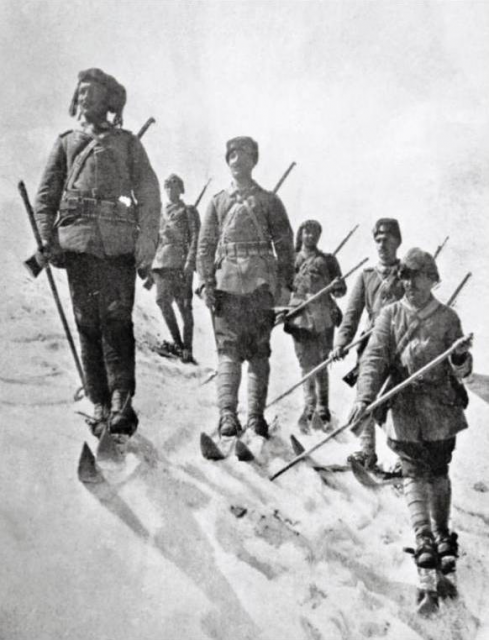 Subsequently, in accordance with an order I received from the regimental commander, I sent a team (the first team was commanded by Second Lieutenant Şarya Efendi) to the forward line, which was under the orders of the 2nd Battalion Commander. 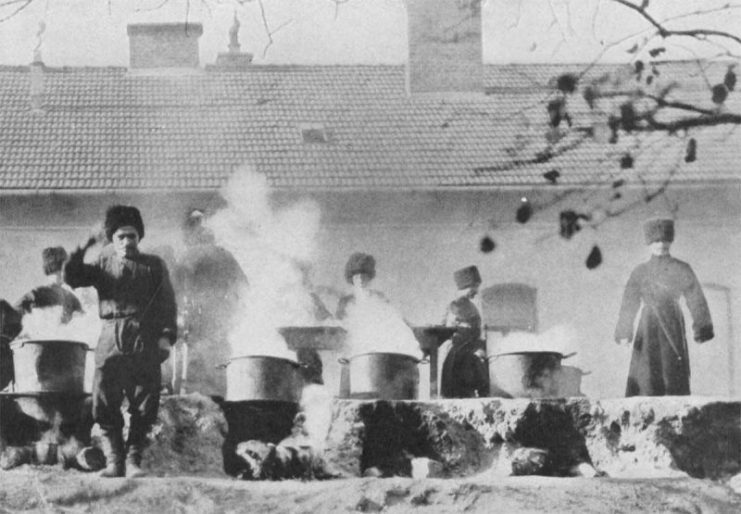 When the regimental headquarters was established at Zimon (today’s Çevrepınar) village, the company, along with its remaining teams, came to that village. There were clashes now and then around the outpost on the Division’s northern front, but it remained calm on our regiment’s front. At the same time, our regiment fortified the main line position. The 3rd Battalion’s third company was situated on a hill south of Zimon village (another company was with the 2dn Battalion further on). There was a machine gun team with the reserve battalion at Boyun Noktası (Boyun Point) that was reinforcing that position, together with the existing engineering company. Trenches were dug here, as well, for machine guns, in case they were needed. 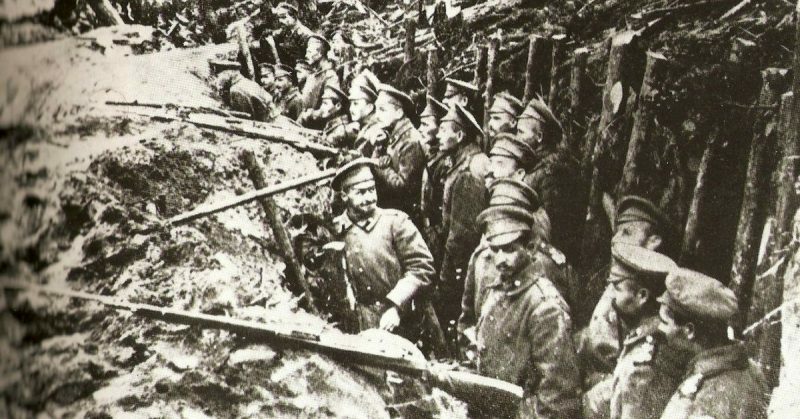 On the night of 19/20 July 1332 (1916), a company of the 97th Regiment abandoned an outpost to the enemy and, in order to re-take it, a company from the 4th Battalion, 4th Regiment, was sent. (The head sergeant of the company that abandoned this position was sentenced to death by an order from the Division. When he heard about this he sought asylum with the enemy. 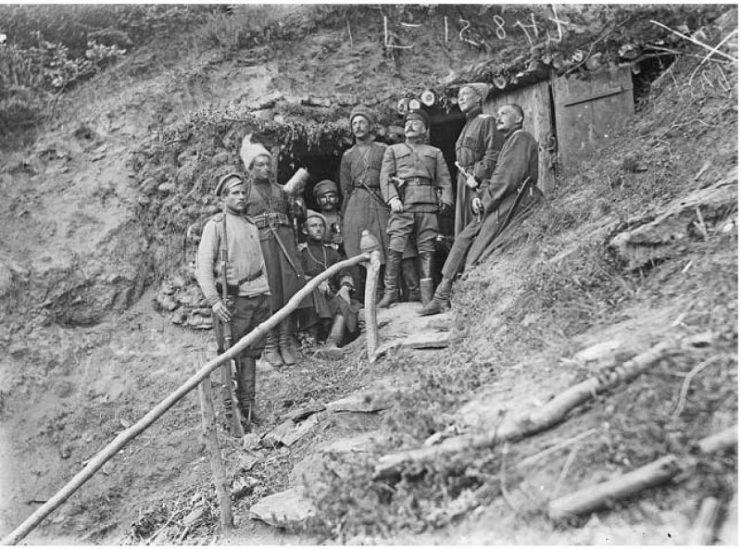 Turkish soldiers, Caucasia, c. 1916. On 20 July serious clashes occurred in the vicinity of the outpost. 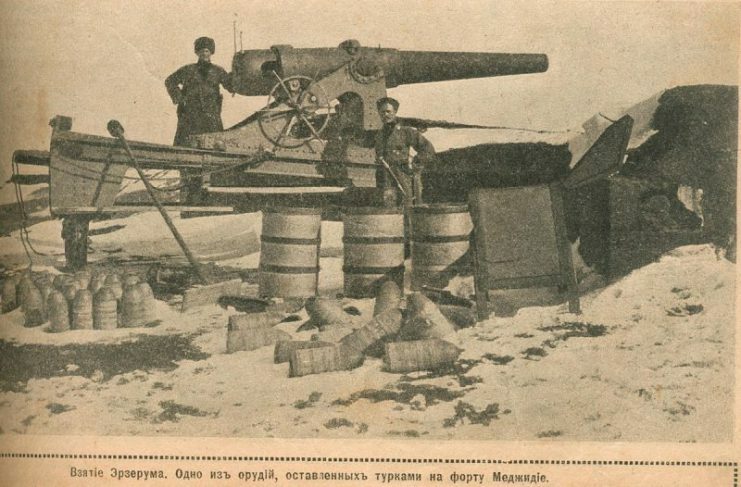 A mountain cannon team at Boyun Noktası provided help with fire from that location. The 97th and 99th Regiments were positioned on this front. But the situation deteriorated. Consequently, the detachment commander (52nd Regiment Commander) spent the night at Boyun Noktası and during the night the northern front detachment was withdrawn to the main line. The night passed peacefully. On the morning of 21 July, there was fierce rifle fire on the eastern front, our regiment’s front. After defending the position as much as possible, our 2nd Battalion and the 3rd Company, which were both there, retreated. Because another mountain team had come to Boyun Noktası during the night, it was positioned in the east. The enemy occupied the hills where our forward-line detachments were situated. At this time our cannon began directing fire there. Nevertheless, the enemy advanced relentlessly and in a scattered fashion. Based on an order I received from the Regimental Commander, I put my two machine guns in trenches facing east. 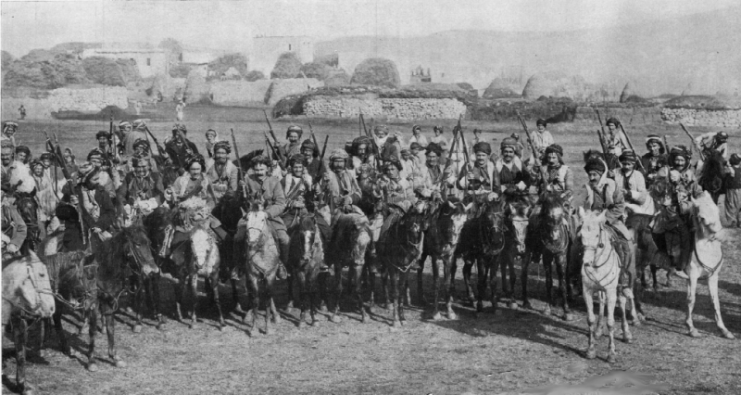 Troops of Kurdish Cavalry who fought against the Russians in the passes of the Caucasus mountains. The enemy was relentlessly advancing from the east. Both the first and second machine gun teams were prevented from advancing because of the firing from the enemy side. However, since the terrain was wooded and irregular, the enemy, too, had trouble advancing so the impact was reduced. Finally, a battle began in the east and the north with infantry and cannon. Based on an order received before 9 o’clock, a machine gun was positioned at a spot facing north, on the west side of Boyun Noktası. The enemy was quiet on the northern front and firing in the north diminished. But our trenches facing north were impacted more by the enemy cannon in the east because they were completely vulnerable, based on the direction of fire. 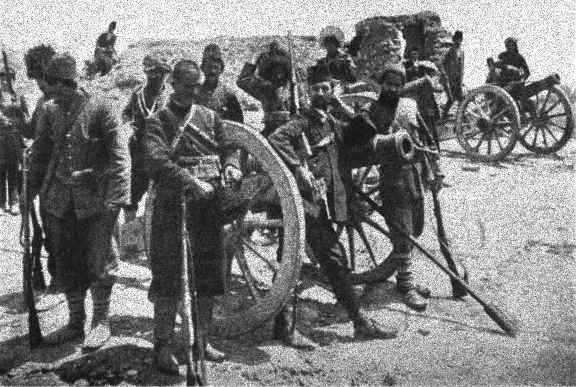 At around 2 o’clock in the afternoon the cannon teams and the 4th Regiment’s 16th Company, which were in reserve, were moved from Boyun Noktası to Taşlıca Tepe. All the while they came under enemy cannon fire both from the north and the east. The fighting was localized and there were only exchanges of fire. After 4 o’clock I obtained intelligence to the effect that the enemy was approaching step by step from the east, hidden in the forest. So our infantrymen left their trenches and began to wait for the enemy in the rear. Since we could not see the enemy from our position, I appealed to the 14th Company Officer of the 4th Regiment and explained the problem. In truth, I learned that the enemy was approaching but our soldiers were positioned in front of their trenches in order to mount a counterattack against any attack on the area behind the trenches. I was able to make eye contact with the infantrymen there. The Regimental Commander is the Detachment Commander and he was at Taşlıca Tepe. When night fell, a detachment order came from the position commander – the 97th Regiment Commander – written as follows: “Certain re-positionings of detachments will take place tonight. 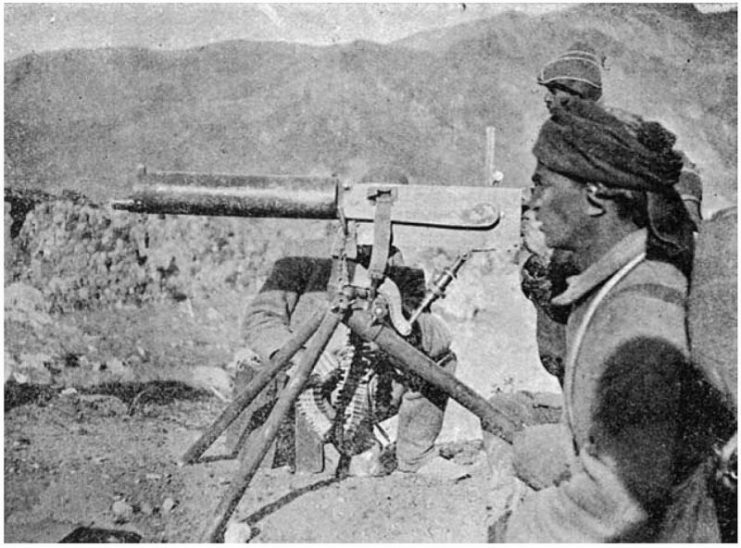 At nightfall, the 52nd Regiment’s machine gun team at Boyun Noktası will move to Taşlıca Tepe and occupy the position they previously prepared there. Based on this order, I gathered up my team and had them eat some cooked food. When night had completely fallen, so the enemy couldn’t see us, I moved to Taşlıca Tepe. Taşlıca Tepe is big and steep, resembling a conical-shaped tent. As the name implies, there are very sharp stones and rocks, separated by extremely slippery grass that makes passage by both man and beast very difficult. We made it to the summit only by taking three steps forward and one back the whole way up. I asked whether I would have infantry support and was told that there were 150 soldiers of the 13th Company of the 4th Regiment there. Consequently, I took the guns and the ammunition down and sent the animals up. I told the sergeant I left there that in addition to instructions already given, he should act according to the commands of the detachment commander, in the event of an enemy raid. I saw the squad of infantrymen in the trench ten feet away from us, at a spot where the rocks came together. The corporal said that they were members of the 13th Company and that the company commander was 200 yards away, at a spot where there was a small fire. The trenches we had previously dug here were facing east. Since it was necessary to dig a trench in the direction of the pasture, I told reserve officer Rıza Efendi and the gunners to dig the trench tomorrow morning before it got light because (the enemy) couldn’t see the ground in the darkness and direct fire there. I had the guns put in the old trenches and since the soldiers hadn’t slept in two nights, I had them lie down next to the guns to sleep but I cautioned them to have someone keep watch. About 2 o’clock in the morning, my ears rang from the sharp sound of shells exploding among the rocks. I woke up and thought first about the detachments ahead of us. And even though I thought it was impossible that the enemy could be approaching 100 yards in front of us, their shouts of “Hurrah!” proved me wrong. At this time, the infantrymen beside us were firing. I realized that the enemy was making its raid and had routed our detachments from their positions. Consequently, I reckoned that our troops were in front and the enemy in back so they probably headed for the top of the hill. Since in the darkness I couldn’t see anything, in order to avoid hitting our detachments, which I thought had not retreated, right away I had Sergeant Ömer point the fourth gun toward the pasture with its barrel raised and told him to open fire across a wide area. My aim was merely to create an effect, but just at that moment a bomb hit the infantrymen’s trench next to us and exploded. I realized we could no longer stay here because the bomb had come from behind us. The enemy had approached us from the rear, from the Zimon side. So I yelled “leave the guns to God. We’re going up the hill!” The gunners came to me with just the gun barrels, without the tripods. I admonished them to go back and get the tripods and I waited for them to fetch them. Right away, the enemy came to the gun positions. There was about 30 feet between us. Those who had gone to get the tripods said the enemy had come so we had no choice but to start to climb the hill. The enemy’s bullets whizzed by our ears and their boisterous shouts of “Hurrah!” were chasing us, as well. We kept on trying to climb the hill because otherwise, we were sure to fall into the hands of the enemy, whose exhaustion was overwhelmed by the scent of victory. As I said before, the difficulty of moving on the steep and rocky ground was amplified by the slippery grass, so I would fall back one step for every two I took. My desire to find the summit spurred me on. But my mouth was open and my chest heaved up and down, as my strength diminished with every step I took. I realized I could not go any further because I did not have enough strength to take a breath. So I screamed at the soldier with me “I can’t go on, you go on ahead!” A soldier came and took me by the arm, allowing me to press on another 10 or 15 feet. He couldn’t carry me by himself so another soldier came and took my other arm. No sooner did he say this, though, then an infantryman came running, crying out “Sir, the enemy has penetrated us!” Just behind him were four or five Russian soldiers screaming “all Ottomans surrender!” and they came running up in front of the rocks where we were. Together with the detachment commander, we screamed at and threatened our soldiers to fire but at the same time we were fleeing to the rear. But when we reached the rocks a bit to our rear there were more Russian soldiers shouting “surrender! surrender!” and they mingled among us. We screamed at our soldiers to fire and they did so, but in the darkness who could tell who was firing at whom, since no one could tell who was friend and who was foe. It was all finished at the point of a Russian bayonet, which was touching my head next to my right ear. I stood motionless, lest that pointed iron scatter my brains. Right away, some more Russian soldiers came, surrounded us and began to search us. I didn’t have my revolver with me. We were now taken at the point of six or seven Russian bayonets toward the Russian lines. This was the worst, the darkest, moment of my life. The exertion of climbing the hill and my consequent exhaustion made my legs tremble so I couldn’t walk. My chest was pounding rapidly and I could hardly breathe. Up to this point, I had kept a professional reserve toward the regimental commander, who was also the detachment commander, but now I had to lean on his arm in order to be able to walk. The Russian soldiers who surrounded us took us to the battalion headquarters – the rocks where the machine guns had been – and made us sit down there. Our soldiers lit a fire and we sat around it, along with quite a few Russian soldiers. Dawn came. The Russian soldiers searching the area found our machine gun tripods amid the rocks and brought them on wheeled platforms. The ammunition was in saddlebags lying where we left them since we couldn’t take them with us on padless horses in this steep terrain. A bit later they brought the gun barrels, so at this point, I realized that the gun barrels had been abandoned when they couldn’t be carried and, consequently, had fallen into the enemy’s hands. Corporal Ömer, the head of the 4th machine gun team, was wounded in his stomach from a dumdum bullet and his intestines were hanging out. He died as he was being taken to a bandaging place. Because it was he who was carrying the 4th machine gun barrel, when he was wounded the barrel was dropped. The other gun barrels were abandoned on the way by the soldiers who were carrying them. When I thought about it I realized that I, who was carrying nothing, couldn’t make it to the top of the hill because of the rocks and slippery grass, so I should have understood how this corporal, with the barrel on his shoulder, couldn’t make it either. In this way, the machine guns had fallen into the hands of the enemy. Fortunately, while we were still among the rocks, the firing by the infantrymen next to us had enabled the removal of our ammunition pack animals and a portion of our materials at the top of the hill. When we got to the top and the enemy mixed in with us, the soldiers I was with all fled and luckily for them they got away. Out of 16 soldiers, three were taken prisoner. I’m now amazed that the others weren’t taken prisoner. It is remarkable that the whole day there was fighting at the line a half-mile ahead of us, yet the reserve detachments here were suddenly surprised by the enemy. The fact that we came face to face with screams of “Hurrah!” from so close a distance means that the forward detachments had failed miserably to do their job. The detachment commander had ordered that “no one shall abandon his position without an order to do so.” Yet, unfortunately, our forward detachments did not comply with this order. In fact, they didn’t fire at the enemy but, even worse, they didn’t fire shots to warn us of the enemy’s raid. They absconded in directions we still don’t know of and completely abandoned the front to the enemy. Yes, the detachment commander, when he gave the order, revealed his own position. 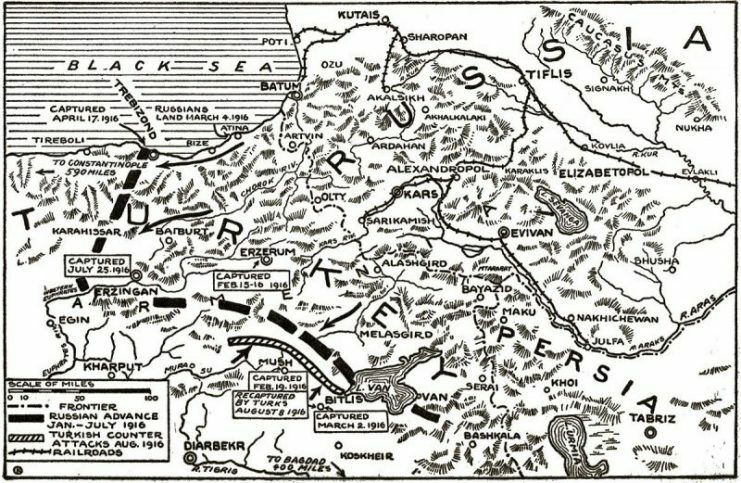 So besides ignoring the order not to abandon positions without orders, the forward detachment commanders, knowing what an important and strategic position Taşlıca Tepe was, that the reserve detachments were there with the detachment commander and that they must not retreat by splitting their own line, did so anyway and without firing warning shots to alert us of their retreat. Who knows under what compulsion and for what reasons they retreated. Not one of these detachments’ officers or soldiers was taken prisoner. Therefore, they didn’t retreat because of the enemy raid. Quite the opposite, they deliberately abandoned their positions and it can be said that, in this way, they left the rear detachments exposed to a sudden and disastrous calamity. Had the companies and machine gun teams of the reserve detachments been aware of the raid on the front line and had the detachment commander, in particular, been made aware of this, the requisite defense could have been mounted based on the situation. As a matter of fact, a defense was attempted against the enemy at close quarters but the entire area was surrounded. So without being able to perform our duty, some of us were able to get away and some of us were taken prisoner. 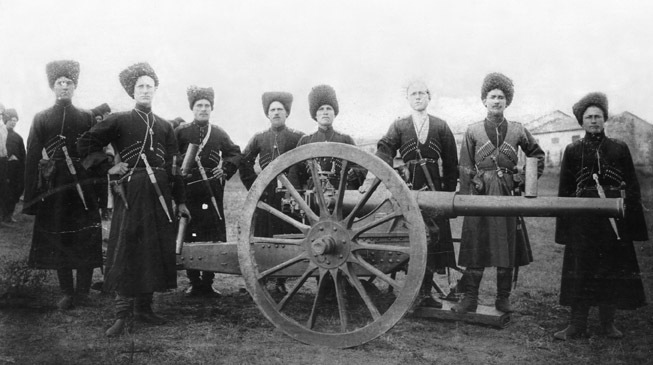 The enemy attacked Taşlıca Tepe with two regiments – the 15th and 17th Cossacks. The enemy units surrounded the hill from the north and from the east (from the pasture and from Zimon) and, with a well-organized movement, stormed the hill simultaneously. We knew this because the soldiers who pointed their bayonets at us were from various battalions and because officers taken prisoner were brought to different battalion headquarters. We did not give importance to the eastern portion, the Zimon side, and did not put sufficient forces there. The terrain here is incredibly steep. Yet the enemy advanced with ease and reached the summit at the same time as the enemy forces coming from the north, effectively surrounding our soldiers on the north, east, and west and then infiltrating among us. There were 100 members of the 4th Regiment’s 13th Company in different spots here but because of the suddenness of the raid, they were unable to establish a solid line near the summit. As I noted above, when we suddenly found the enemy among us our soldiers scattered. For these reasons, the enemy was able to take this important hill at minimum cost. We must be grateful, though, that the detachment commander ordered the cannon that were here during the day moved to the division headquarters at night, saving them from the enemy in the end. Otherwise, it would have been necessary to add four cannon and the animals to the total of our losses. Our company’s first team was located on the hill south of Zimon. When the enemy stormed the hill the next day the soldiers there, together with two officers and the battalion doctor, were taken prisoner. It was understood from the statement of the captured officers that when they saw their situation was dangerous, our team here withdrew early in the morning. It is my sincere conviction that our detachments on the front line displayed great cowardice and treachery when they abandoned the line and that they are completely responsible for causing this calamity. After his time at the Satılmış Gedik prison camp, Lt. Ekrem went by prisoner train into Russia during the months of December 1916-January 1917 and personal documents show that he was at the Russian prison camp at Nerekhta, east of Moscow, in August and September 1917. 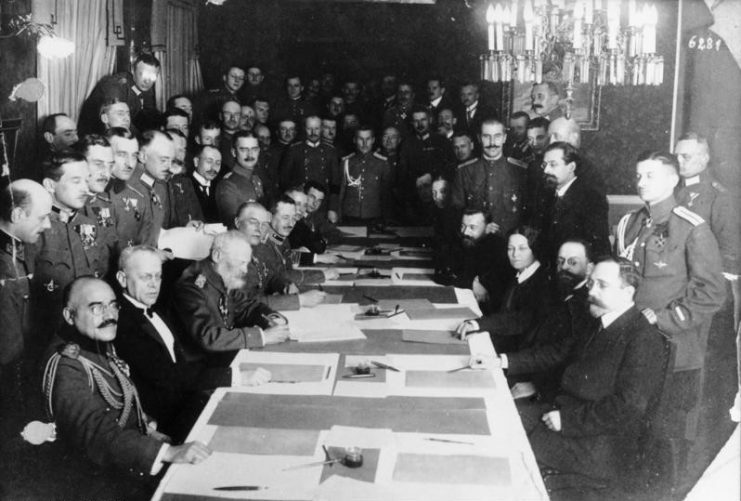 A year later, though, in August 1918, Lt. Ekrem was in his hometown of Biga, in western Turkey, evidently having benefitted from the Brest-Litovsk peace treaty signed between Turkey and Soviet Russia on 3 March 1918.